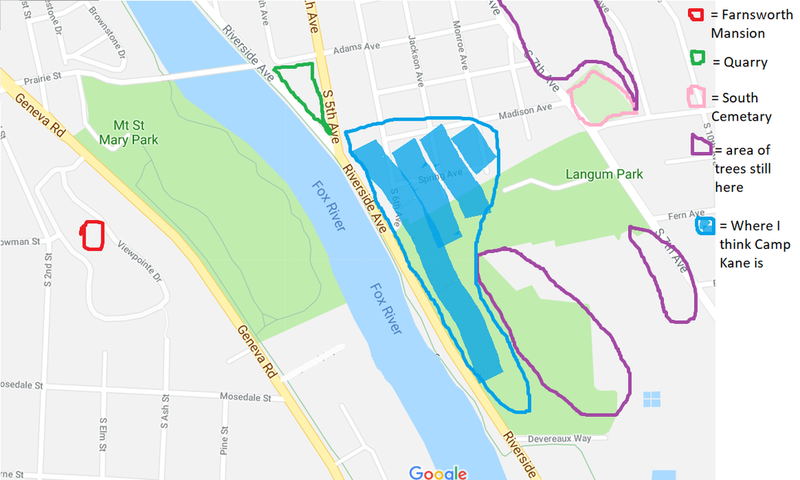 The area of Langum Woods, near the east bank of the Fox River, has had a few names in the past few centuries: 55 Acres, Camp Kane, and now Langum Park. The area has quite a rich history, dating back to the Civil War. The southern end of Langum Park is dedicated with a memorial for Camp Kane. When I read about Camp Kane, I started to wonder where exactly camp Kane was located. I started researching the area to see what the area of St. Charles looked like in the 1860s and what remains of those buildings today. Camp Kane was located in and near Langum Woods but the exact location is unclear without evidence. The following information along with reference to a map of St. Charles from the 1860’s helps achieve a better understanding of where the camp was located. I started off searching the internet for what I could find about Camp Kane. I quickly learned that the camp was located on land that Col. John Farnsworth had owned on the east bank of the Fox River. The land sat between the Fox River and 7th avenue. The St. Charles Library website also mentioned that the camp is in the location of today’s Langum Park. I then went to the museum’s primary sources to see if I could confirm and narrow down the location of the camp. In reading various primary documents about Camp Kane, such as books, brochures, letters, and journals, I further strengthened the beliefs of the location that my previous sources had stated. I knew where the South Cemetery was and the Fox River, but I didn’t know the location of the McCauley’s quarry. My next step was to uncover the location of the quarry. I soon came across a history of the McCauley family of St. Charles. The author, Ken McCandless believed he had found the location of the quarry at the junction of 5th and Riverside Avenue, and at first, I also believed this was the location of the quarry. After hours of sorting through the museum's photographs and primary documents, I became stuck with no idea what to search for next. Perhaps this meant I was done with my long and difficult journey locating Camp Kane. I reflected on my research journey and began to realize many of the sources I read were 2nd hand accounts. I wasn’t reading the evidence, I was reading about the evidence. In search of this original evidence, I went to the Kane County Government buildings to discover more. While I was there I looked at old maps, aerial maps, and deeds from the late 1800s. I found evidence that contradicted and proved my original ideas wrong. One of the most surprising things I learned was one that contradicted what many people had written about Camp Kane and Col. Farnsworth. Many people believed that the camp was set up on land that Farnsworth had bought in 1858. There is no record of Farnsworth owning land on the east side of the Fox River. The deed that I found for Farnsworth buying property in 1858 was for land on the west side of the river where the mansion was later built. The land that people assumed was owned by Farnsworth, was actually owned by a farmer named Ortho W. Perkins. Colonel Farnsworth was a well-respected man and most likely asked Perkins to use the land for the Civil War and Perkins agreed. This could be a reason for why there is no record of a land transaction. I even remembered a quote I read which mentioned the soldiers being camped on a part of the Perkins farm. Before seeing the evidence I had quickly overlooked that statement. When looking at some maps from the mid-1900s, there was a land feature that caught my eye. In the area of Langum Park where the baseball fields are now, was a landfill area. If there was an area to discard unneeded tailings and dirt, it is quite likely that this was the area of the quarry. I viewed an aerial photo from 1939 which showed an area which looks like a stone pit on the northeast corner of Langum Park. This seems like a much more likely location for the quarry than the area Ken McCandless said the quarry was. The block between 5th Ave and Riverside Ave is much too small to be a quarry. This photo is most likely McCauley’s quarry. It is an image of a quarry in St. Charles from the late 1800s and it is unlikely there was more than one quary inSt. Charles at that time. At this time, I rethought my theory about Camp Kane being located north of Colonel Farnsworth’s mansion. The soldiers passed his house when they marched south to Geneva. I know before the regiment left there was a ceremony to show them off. This ceremony most likely took place in town. From town they would have marched south, past Col. Farnsworth’s mansion and continued on to Geneva. With all these facts in mind, I created a new map showing my new thoughts on the location of Camp Kane. 1861 Farnsworth set up Camp Kane on land owned by Otho Perkins for the 8th Illinois Cavalry Regiment. 1864 Farnsworth set up camp again for the 17th Illinois Cavalry Regiment. 1925 Mayor Langum set aside 20 acres in 1925 to be a city park. 1978 First time Langum Park was in the St. Charles city directory. 1982 June 13th, finally after 67 years of trying to dedicate it as a historical park a memorial was put in place at camp Kane and dedicated as a historical site. 2000 In 2000 wanted to rebuild the Farnsworth mansion in Langum Park standing right across from where it was once built at the south end of the park. 2014 The Jones Law Office was moved from Cedar Ave. to its current location in Langum Park. During the Civil War, the law office served as a military recruiting headquarters. Langum Park is no longer the 55 acres it used to be. The park is now a total of 31.2 acres. The park area has increased since Mayor Langum set aside the 20 acres of land 98 years ago. The forested area of the park has shrunk to about 9 acres. Today the park has baseball fields, tennis courts and a playground. There are plenty of picnic tables throughout the park and a great view of the Fox River. In the winter there is a sledding hill and an ice rink for hockey. On the south end of the park stands the Jones Law Office along with multiple signs about the Civil War and Camp Kane. Civil war reenactors have come to Langum Park multiple times throughout the last few years. Langum Park was named for one of St. Charles longest serving Mayors, Doctor I. G. Langum. Mayor Langum set aside 20 acres of land in 1925 to become a public space. He was a very productive mayor and St. Charles benefited from his good deeds as mayor. He was the Mayor for seven consecutive terms. He started a soup kitchen during the Great Depression and many other projects to help the community during the difficult time.